We never put ornaments on our Christmas tree last year. What I remember most about last December was being weary. I can point to any number of segments of 2016 bearing legitimate reason for fatigue, but last December doesn’t have any claim to fame other than it was simply December and we were tired. Carl and Caleb found the most exquisite tree which extended to the very top of our ceiling. It didn’t have a bare spot needing camouflage by a handy corner and the fragrance was unmatched. Carl and I decided to string the lights while Caleb was out for the evening. We opened the box and I questioned, “Who put these lights back in the box like this?” Sadly it wasn’t a rhetorical question. 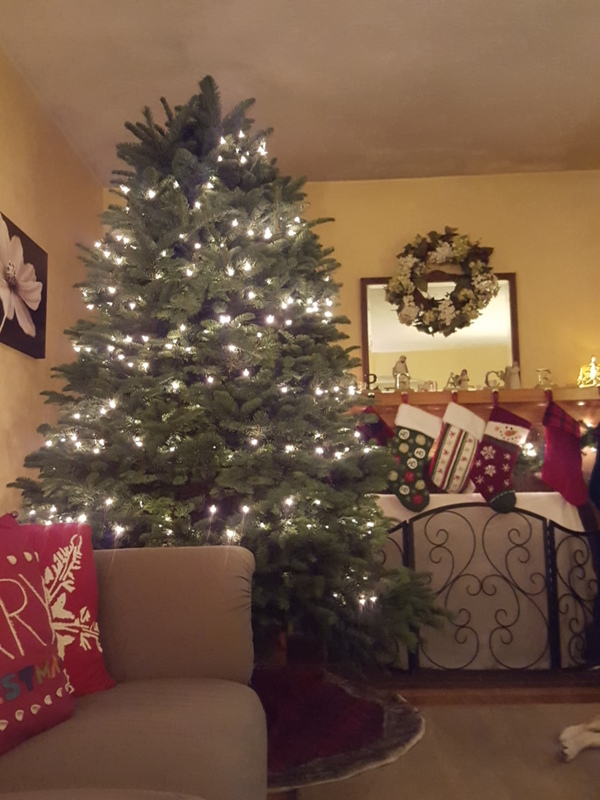 We plugged the lights in and several strands had burnt out bulbs. We started to place the lights on the tree and disagreed with the proper method. I thought the tree needed more lights and Carl thought it looked fine. The tree trimming halted with Carl putting on his coat and driving to Walgreen’s for more lights. I am positive neither one of us heard the faint Christmas songs in the background but I will respond to what you are thinking. Yes, I am most definitely a treat to live with. Upon Carl’s return, we finished lighting the tree mostly in silence. We stowed the ornament boxes in the dining room to allow Caleb to join in our merriment on another evening. We kept meaning to hang the ornaments, we talked about it but we never opened a single storage tub. In fact, Caleb deemed the tree perfect simply with lights. I suppose our souls felt as bare-boned as our Christmas tree and yet it was beautiful. During 2016, it seemed to be a weekly line-up of news stories which shocked, saddened and drew out weariness. Wouldn’t you agree? I can pinpoint the places in our family’s life but as I close the chapter on 2016, I am not sure I have ever experienced such a prevailing, unmovable level of every dimension of exhaustion. When added to the election season, the residue of fatigue seems to coat my soul. Days after the election results, I wrote a quick post on Instagram which I also shared on Facebook. A collection of my raw emotions, the Sunday after the election. Then I closed my phone and other than the writer in me fighting editing what I wrote or adding to what I had omitted, I forgot about it until my phone started to vibrate with responses and direct messages embodying a collection of thoughts and sentiments. Overwhelmingly, the responses not seen on my page were an outpouring of love or understanding and for the few that were on a different page, I felt shards of grace. I could sense that in my honesty and brokenness, I represented a person of safety and it would be damaging to quickly assemble a fence of opposition. If we don’t allow each other to speak our words out loud to someone who experiences the world differently, how will we see how those words singe the air and the other person? Will you indulge me with quite a simplistic metaphor? America has been a tall and expansive tree decked out in sparkling lights and crammed full with ornaments. Every attempt has been made to conceal the bare spots and not reveal the decaying network of branches. We can’t overt our gaze from the deeply ingrained problems of our nation. America has been stripped bare. We have witnessed this fact and the whole world in tandem. It is quite easy to feel quite downhearted and hopeless. I mean, if after 30 years of marriage, Carl and I still can’t agree how to untangle lights, how can I envision our States being united or it’s people softening their clenched fists towards one another? We are not a people without hope. I believe there are still lights sprinkled all over America. I think it’s you and me, doing whatever we are called to do during the years to come. Some may write letters and others may have conversations. I think the most powerful words we can utter to one another is “I didn’t realize…”. Some will look at the landscape of their relationships and see only a single hue or experience or class or culture and seek to change this fact. Others will help us see places of injustice and oppression and wave a flashlight over an unseen truth. I hope all of us will seek to have our vision adjusted even when it feels unbearably painful. We need everyone. No one should be discounted. I believed during the course of my life, if I simply walked into any situation being myself, leading with kindness and friendliness, even if I didn’t resemble anyone else, leading with love would be enough to change a multitude of people’s minds. I am not sure where I stand on that belief today but what hasn’t changed is my desire to love, be kind and extend grace. Perhaps a more important tenet is to remember and believe is that God is the changer of hearts, not me. Today I say to you, go forth and be the light you are designed to be in this world. Be one of the strand of lights encircling the framework of the tree. Be the hope that will encompass our country and our world. We all may feel as if we are only one tiny bulb of light, but not when we stay connected and patiently untangle all our knotted emotions. That was heavy. Allow me to tell you a few things which are helping mend my mind, my heart and my soul. When we are weary, we need simplicity not complicated ideas. Several months ago, I realized my reading material was weighing me down as much as perusing the threads on Facebook. I always have a huge TBR list but any title with heavy subject matter is off-limits for now. I re-read Anne of Green Gables in a weekend and how can your rib cage not expand when you read of Anne’s delight over tasting ice cream for the first time? I could walk to any number of gourmet ice cream or donut shops. I want to lasso wonder in my life. So many ornaments in my life, crowding out simply joys. I joined an online book club (that is called an introvert’s dream) and the first book was Beyond Loneliness: The Gift of Friendship with God. No one wants to admit to loneliness as those around you may feel they need to fix it or believe they have failed or are not enough. If we are honest, most of us are lonely in some way.Social media and technology has given us distant connection and not across the table fellowship. For me, there is no one who can touch those areas other than God and until I admit to this realization, He can’t tend to those broken places. I hardly ever give books I haven’t read. But last Christmas, and this past November, I gave a widely praised book. I finally read A Man Called Ove last week and tears spilled onto the last few pages. Not to mention how much I laughed out loud over the course of the book. The themes couldn’t be anymore applicable to our world at the present. Laughter and tears are both wonderfully important components in healing. When life feels heavy, I tend towards quiet. I forget about music. Over the past few months, I have had the opportunity to get lost in attending live musical performances and it will be a lifelong priority. I was late to Hamilton fever. I knew about the Broadway musical but didn’t take the time to listen. There are not enough adjectives other than to say, it is brilliant and I find it prophetic for these current times. If you don’t think it’s your thing, watch the PBS’ Great Performances Hamilton’s America and you might change your mind. Also the entire soundtrack is available on Spotify. Josh Garrell’s Christmas offering The Light Came Down is getting heavy play time currently. There is something about his tone and the haunting quality of his voice that smooths out the crevices in my heart, this one took me by surprise. The family has been battling squirrels and watching birds. I continue to love watching the birds at our feeder. It allows me to exhale and consider simple creatures. It reminds me about the importance of provision. We provide food to nourish and it creates a rhythm and an expectation for the birds. I lament whenever forgetfulness causes the supply to run low and yet I see the smallest of birds, rubbing their beaks along the empty suet cages, willing to be satisfied with the memory of seed. How thankful my Father’s supply is without end. Lastly, I am resting and saying no more often. When I am tired, it’s a mistake to attempt to crowd out the exhaustion with busyness, it is the perfect time to strip away the non-essential and take a nap. Perhaps take a stroll outdoor and then curl up under the comforter. What is your weariness remedy? Hazel’s paws can be seen. Her favorite place, close to the tree. We miss her immensely. He took our humanity, just as it is, with all its wretchedness and ugliness, and gave it back to us just as his humanity is, transfigured by the beauty of his living, filled full of his joy. So that no matter what suffering we meet, we can meet it with the whole power of the love that has overcome the world. God intimately and silently shares all our secrets, no matter how hidden we may keep them from other people. God knows our hidden selves and still God is pleased to be one with us. God rejoices in our private triumphs and shares the pain of our unspoken sorrows–all in complete and undisturbed solidarity with us. Christ’s humanity remains the point of connection between our human lives–however seemingly petty and small–and the veiled, ineffable and eternal life of God. Hello! I nominated you for the Blogger Recognition Award. You can check out the link below for more information! Thanks for being such an awesome blogger! Girl, your posts are few and far between which makes them even more rich for the reading. I couldn’t decide what I liked the most–so many powerful and poignant phrases here. I read Anne of Green Gables and Anne of Avonlea this year and delight is the one adjective that about sums them up. You know how much I treasured our chance to talk about issues in our world today. I am grateful for your friendship in that regard. Totally spot on in the ‘how to battle weariness’ dept–do not add more, take things away. We need simple to hear the sound of God’s voice. Bless you and your family this season–your ornament-less tree is beautiful! Excellent, I am sharing this on my Facebook page.